Mix eggs with green and red peppers and sausage crumbles. Cook to a soft stage scramble. Lay flatbread out on parchment-lined sheet pans. Divide cooked egg mixture to spread evenly over each flatbread. Combine mozzarella and cheddar cheese and sprinkle ¼ oz. 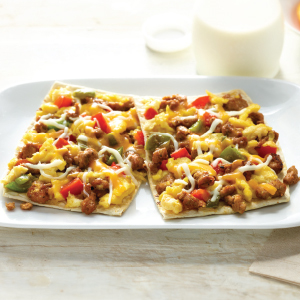 over each flatbread. Bake at 425° F for 8-10 minutes until the cheese is melted. MEASURE: 1 c. 6 oz. MEASURE: 3 c. 2 oz. Whole grain flatbread, 1 oz. 1 serving provides 2 oz. meat/meat alternate, 1 oz. equivalent servings bread/grain. Eggs, large, beaten, or frozen 25 ea. 50 ea. Pasturized eggs, thawed 2 lbs. 11 oz. 5 lbs. 6 oz. Green bell peppers, diced 1 c. 6 oz. 3 c. 2 oz. Sweet red peppers, diced 1 c. 6 oz. 3 c. 2 oz. JENNIE-O® Turkey Sausage with Spicy Italian Seasoning, #639630, thawed 3 lbs. 2 oz. 6 lbs. 4 oz. Whole grain flatbread, 1 oz. 50 ea. 100 ea. Mozzarella, LMPS, shredded 13 oz. 1 lb. 10 oz. Cheddar cheese, yellow, shredded 13 oz. 1 lb. 10 oz.